Break-out to the downside of triangular trading range. 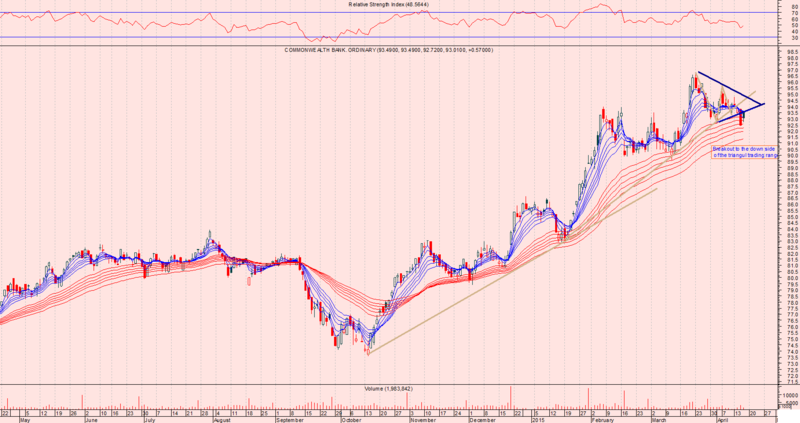 CBA has been in a strong uptrend since October last year. A record high of $96.60 was reached on the 23/3/2015 prior to the share-price entering into a triangular trading range, with the prices easing somewhat. In the last two trading days there has been a break-out to the downside, forming an Hirami candle-stick pattern, suggestive of a possible change in trend. It is still not clear whether the momentum of the preceding up-trend will carry the price beyond the $100 resistance level. or whether the trend will change. CHART REVIEW – UPDATE ON SIRTEX.